Each picture in these galleries has been created through the fusion of multiple photographs taken at successive depths of field. This maximizes the amount of information contained in the final photograph by approximating a 3D image. Numerous herbaria have kindly made available their collections. Vouchers and herbaria are indicated for each collection sampled using the acronyms from Index Herbariorum. Flowers and capsules were rehydrated in 50% ethanol that was warmed on a hot plate. One can also hydrate the material by boiling for a few seconds to a few minutes (depending on the fleshiness of the sample) in distilled water. When using water, some species tend to become fragile and may disintegrate during dissection. Additionally, boiling in water results in more air bubbles in the samples (usually in the least desired places!). 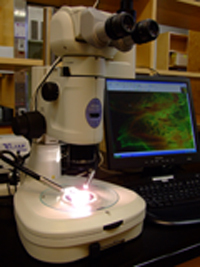 For dissections, photography and measurements we use a Nikon SMZ1500 stereomicroscope equipped with a PaxCam Arc digital camera and Pax-it imaging software. Cuscuta flowers are often translucent and using oblique coherent contrast light (OCC) makes a great difference, especially when examining infrastaminal scales. Full flowers, undissected calyces, corollas, ovaries, capsules, and seeds were placed in concave slides and immersed in 50% ethanol. After taking photos of the 3D volumes, flowers were dissected and the opened calyces and corollas were placed in a drop of 50% ethanol on typical flat microscope slides with cover slips. Generally, 2 to 15 photos were taken at successive depths of field for each element of morphology. In general, fewer photos were taken for dissected calyces and corollas or for low magnifications, and more were taken for full flowers and capsules or for specimens at high magnifications. Photos were then “stacked” with Pax-it to create the 3D effect. A halo sometimes resulted as an artifact of the fusion, and these photos were kept only as long as the morphological details were easily visible. No additional improvements of alterations were done in Adobe Photoshop or other image editing software. Although sometimes we used a digital color filter when we took the photos to enhance details (these images have a characteristic “fluorescent” green appearance), what you see is the real color of rehydrated samples under the microscope. Keep in mind that the fresh white flowers of some species turn dark-brownish (or even reddish) when plants are dried to produce the herbarium sheets (e.g. C. boldinghii, C. mitriformis, C. macrocephala – to mention just a few). Rehydration cannot restore the original color of these flowers.